Starting things can be difficult: a diet, a new job, a company. A lot of hard work, focus, and dedication go into beginning a new chapter of your life. And starting a business from the ground up isn’t exactly easy. Especially if the ground you are building from is behind prison bars. Seth Ferranti is an author that began writing books and articles while serving a 25 sentence for a first time non-violent drug offense for supplying 15 colleges in five states with LSD and marijuana on the East Coast. While in prison, Seth got clean and then got creative. He started up his own publishing company, Gorilla Convict. Seth’s attitude and writing earned him respect, even across prison yard race lines. He was able to watch YO! MTV Raps in the black TV room and became interested in the street legends rappers like Nas and Jay-Z were rapping about. He was particularly intrigued by Kenneth “Supreme” McGriff, a Queens gangster that was both respected and feared. Supreme Team has since become one of Seth’s top selling books and has gotten recognition from within the street community and various reviews. In 2014, Seth got out of prison and started on a multimedia adventure, learning as much as he can, as if making up for lost time. One of these new creative outlets was comic books. Seth had to put together his own ‘supreme team’ to tackle this comic. Stache Publishing’s Anthony Mathenia (Pretty Face, Butterfly) helped guide Seth through the comic making process from the beginning. “Anthony is amazing with color and the book wouldn’t be the same without his edits. He really helped me to hone and focus my vision for the story.” Seth says. Seth is a go-getter and doesn’t let anything slow him down. After spending some of the prime years of his life behind bars, Seth has resurfaced in society as a creative mind with a strong work ethic. “I just like to complete projects, get them done, and get them out there to the world.” Seth has plans for many more projects including a film version of Supreme’s story. And what is different about Seth is that he doesn’t just have plans for them, he has already started working on them. Seth’s freedom has opened up all the creative channels for him. Supreme Team has a campaign running on Kickstarter throughout the month of August. You can preorder your copy of Supreme Team #1, signed copies of Seth’s non-fiction true-crime Supreme Team book, original copies of the hard-to-find Don Diva issue with Seth’s Supreme story in it, original artwork by artist Joe Wills, and the Limited Edition Kickstarter-only Hardcover. Sometimes an image can spark all kinds of ideas and inspiration. Boaz Lavie and Hanuka brothers used a breathtaking and iconic photo as inspiration to collaborate on a riveting graphic novel that explored the imagery they felt while viewing the photograph. The Divine graphic novel is the result of that and The Gr1nd got with Boaz to have a chat about his foray into the comics industry, working with the brothers, the making of the comic and its publication. The photograph you based the story on is iconic, what about it made you want to do a graphic novel? Tomer saw the photo in 2007 and went on to read anything he could about the real story behind it. Both Asaf and Tomer were deeply affected by their story – by the facts they supposedly had super powers, that they were twins, and that their childhood was so radically different than our own. In 2009 I joined the project as its writer and we started working on it together, with the plan of making a graphic novel, inspired by the real story. A lot of the images are surreal and very impressionistic did you come up with the concept for the story or did the art come first? Explain. It was a combination. Some early concept art was created, mainly by Tomer, before any writing was done, and it served as inspiration as well. Most of it had to do with the twins themselves, and their surrealistic environment. Once the story was more developed, there were many ideas in it that called for more fresh concepts and art, so it was actually a dialogue between the art and the writing. Is this a stand alone graphic novel or is therefore to come? It was created as a standalone graphic novel. One complete story. What was it like working with not one but two artists who are brothers? We had known each other for more than 20 years. We’ve actually met during our army service. So our relationship is very rich and complicated as friends, even without doing such a huge project together. Our work together was very organic, in this sense. There were many ups and downs, and many fights actually, but all along we kept going at it as a group of friends who’re doing something they love, together. A dream project, if you will. How did you come up with the storyline of the bad American and the good one? Asaf had taught me that when illustrating comics, it’s very important to be able to define your characters very quickly, in simple artistic terms. People should be able to recognize them easily so many times during the story, you can’t get too tricky about it. So in creating the characters in the story, I kind of took the same approach. I think there’s much more into both of them than just the “bad guy” and “good guy”, but they do represent something deeper about American culture and its different aspects. Where did the idea for the giant soldiers from the figurines come from? Tomer had researched South East Asian culture and we came upon similar images of local gods. That was the inspiration. Also the brothers power where did the inspiration for that come from? There’s a one big theme in the book and it is “birth”. There’s a spoiler here, but the brothers’ power is their ability to “get things out of things” – trees out of the ground, internal organs out a person’s body, etc. It’s basically playing around with the same theme, only on a different field. You mixed an iconic image and a real story with fantasy and fiction to come up with a fantastical tale, explain the creative process? We treated the iconic image as an inspiration. When I joined the project in 2009 I wanted all of us to agree that we’re going to build something that is 100% fiction. It’s not going to be about the real twins, or their story, not even about a real place. I’ve invented this country, Quanlom, in order to distance ourselves from reality. So there’s a mix here of real historical background, and wild imagination. The real story was just a starting point, for us. When you rummage around one’s basement, you would expect to find the typical flair: Christmas decorations, boxed up children’s toys, the water heater. In the Wills’ household, you may find something you didn’t expect when take a walk down the steep staircase. Under the pipes and wooden floor beams sits an enormous sleek contemporary black glass table holding a 32 inch flatscreen TV, a Cintiq Wacom tablet, a Mac, and a large printer. The television has an Anime show paused on it, the distraction became too great. English subtitles demand too much attention. Daft Punk is now playing on the Mac. The concrete walls are dressed up with framed Savage Wolverine and The Ultimates pages drawn by Joe Madureira. Former comic convention ‘swag bags’ and Artist Alley badges hang from the overhead pipes like moss on a Louisiana tree. To the immediate right of the large table is a contemporary clear glass drawing table. In the light of a drawing lamp, a man sitting on a comparatively smaller leather deck chair is hunched over the desk. “I’m in a Dungeon.” laughs Joe Wills. Joe Wills is a particularly cheery, energetic young man. Joe’s warm personality and constant smile livens up the cool, damp basement. Joe is a St. Louis comic book illustrator and is a member of the artist collective, The Illustrata. Comics have been a part of Joe’s life for years, ever since he picked up a copy of Spawn #16 drawn by Marc Silvestri. “I was hooked.” he says. Joe got into illustrating his own comics with the St. Louis based anthology publisher, Ink & Drink with their anthology titled ‘Hammered.’ He is now a regular contributing artist to each new anthology. In a perfect world, Joe would be already be illustrating an X-Men or Thor comic book. Now, he’s stretching his artistic chops by adapting bold superhero style to Seth Ferranti’s comic Supreme Team. Check out this video of Joe Wills talking about the Supreme Team project. Seth Ferranti spent 21 years in the Federal Prison system serving time for a first-time non-violent drug offense, so the true-crime writer has lived in a world that can be compared to the Supreme Team comic on some levels. Supreme Team has a campaign running on Kickstarter throughout the month of August. You can preorder your copy of Supreme Team #1, as well as exclusive Supreme Team swag, original artwork by Joe, and the Limited Edition Kickstarter-only Hardcover. 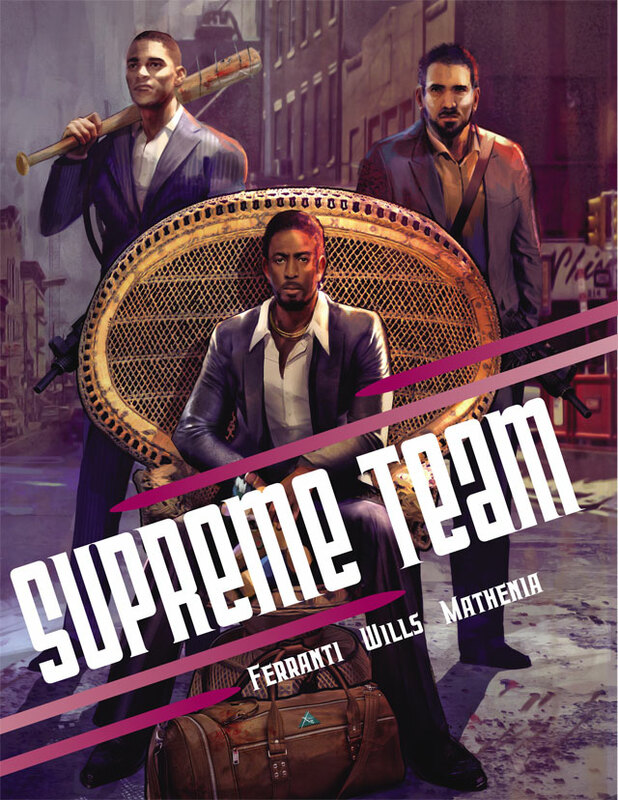 Supreme Team is written by Seth Ferranti, illustrated by Joe Wills, and produced by Anthony Mathenia. Supreme Team Writer/Creator: Seth Ferranti by Jordan Williams Starting things can be difficult: a diet, a new job, a company. You hear “Supreme” in reference to comics books. 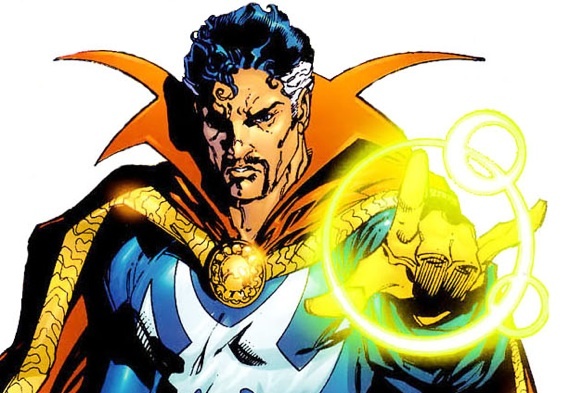 And if you’re like me…you think of “The Supreme Sorcerer,” Doctor Strange. But we’re going in a different direction. Meet Seth Ferranti, writer of The Supreme Team. He has been working with Stache Publishing’s Anthony Mathenia to transform his book into a graphic novel. Hear Seth’s own gripping tale about his life and how he came to learn the stories he shares in his writing. You can help Seth, Anthony, and artist Joe Wills’ work to reach fruition by supporting the Kickstarter, going on all through the month of August. This is the most riveting and real true comic coming out today. Gritty and raw, writer Seth Ferranti brings you the tale of Queens most infamous gangsters who not only took the drug world by storm they influenced and supported the rapper in the early day and hip-hop was emerging as a cultural art form. See how the drug dealers and hip-hop artists juxtaposed the streets in a vicious attempt to come up by any means necessary in the rap game, crack game. But when the bodies start dropping the rappers don’t want to play. Because when you bring gangsters into it then it always gets too real, too fast. This is the Supreme Team’s story. Drawn by the amazing Joe Wills and colored by the incomparable Anthony Mathenia. This book needs your pledge on kickstarter now. Thanks. Expression and art form merge between Marvel Comics and the world of hip-hop with a unique line of HIP-HOP Variants covers inspired by some of the most iconic and well received hip-hop and rap albums of all time. Accompanying each all-new #1 from Marvel Comics coming this fall, fans will get the chance to purchase their own Marvel Comics variant cover featuring their favorite Marvel characters paying homage to some of the most well-known and vocal musical artists over the past couple of years. Legendary and relentlessly loyal Wookiee warrior, Chewbacca, has continued to battle the empire in the hopes of restoring freedom to the galaxy. Through unwavering and steadfast devotion to the rebel cause Chewbacca has always stood on the frontline to bring peace to a galaxy far, far away. This October, Chewbacca, along with an unlikely side-kick, proves why he is one of the fiercest warriors among the stars in CHEWBACCA #1 from writer Gerry Duggan and artist Phil Noto. Don’t call him a fuzz ball. Don’t call him a walking carpet. This is Chewbacca – fierce and loyal warrior of Kashyyyk in a brand new Star Wars series coming from Marvel this October! Two of the biggest comics in the world collide as STAR WARS and DARTH VADER cross over for the first time! Today, Marvel is pleased to present VADER DOWN – a blockbuster six-part crossover beginning this November! Chartbusting writers Jason Aaron (Star Wars, Thor) and Kieron Gillen (Darth Vader, Young Avengers) join forces with blockbuster artists Mike Deodato (Original Sin) and Salvador Larroca (Darth Vader) combine both ongoing Star Wars titles for a crossover in the mighty Marvel manner! Vader’s TIE Fighter has been shot down. Seeing this as their one, best chance to take Vader down once and for all, the Rebellion is ready to throw everything they have at him. Alone, outnumbered, and outgunned, Darth Vader now must face down the entire might of the Rebel Fleet. But the Rebels are about to learn the true unrestrained power of the Dark Side of the Force. With the Rebellion putting it all on the line, could this risky gambit cripple their forces in the fight against the Empire? To defeat their greatest enemy, the Rebel Alliance will risk it all. Be there as the Star Wars: Vader Down crossover kicks off in an oversizedVADER DOWN #1 one-shot this November and continues in the pages of STAR WARS and DARTH VADER! Catch up on these two blockbuster hit series from the very beginning! Pre-order STAR WARS VOL. 1: SKYWALKER STRIKES and DARTH VADER VOL. 1 – on sale later this year! Giant monsters! Super-sized beasts! Mysterious creatures! Jake LaGory is a North Carolina artist with a passion for (super)nature’s big, bad, and beautiful. His illustrations celebrate the famous monsters from fiction and folklore that inspired him as a child. Now he inspires the next generation of artists as a teacher in the Asheville public school district. GR1ND caught up with Jake to talk about his Cryptozoology Coloring Book and his new digital painting series, The Aphotic Zone. Jake LaGory braves the outdoors with a little help. I’ve been drawing for as long as I can remember. As a child, I used it as a tool to explore my interests, specifically in monsters and dinosaurs. I remember taking every opportunity to draw, grabbing a sheet of printer paper and whatever tools were available. As I grew into adolescence it waned a bit more like a doodle in class here or there. It wasn’t until late high school and college that I began to re explore and expand my skills toward attaining a career in the arts. Now I teach art in the Asheville public schools and do my illustration the side. You are previously from Chicago, what brought you to North Carolina? Chicago is a wonderful city with great culture, but its very large and sprawling. I grew up hiking, canoeing, and camping and felt the need to live in a smaller more natural environment. My wife (then girlfriend) and I moved down shortly after getting our degrees (about 4 years ago). How did the change of scenery affect your art? Being in Asheville is a constant source of inspiration, from both the community and the mountainous environment. Within 2 months of moving here, I found out about ZaPow, a new pop-culture gallery that was about to open in downtown Asheville. It was a perfect fit and I was stunned to have such a great opportunity to share my work with the community so quickly after relocating. Having a venue to show my work keeps me motivated to make more work and constantly improve. I still show my work there now. As a public school art teacher, the community support is very strong. There are so many opportunities to share my students’ work with the community. It’s a great resource. Many of your art pieces feature giant animals, what interests you in super-sized creatures? I guess this goes back to my childhood fascination with dinosaurs and monsters. As a kid, I also loved watching the stop-motion animation work of Ray Harryhausen, which often featured giant sized creatures. Ultimately, it comes back to exploring the natural world and wondering “what if?”, and the fact that the more I explore them as a subject in my work, the more ideas pop into my head. Giant monsters are pretty much a part of my artistic DNA at this point. Do you have a favorite monster? I’m most interested in aquatic monsters, whether real life or imaginary. When it comes to the psuedoscience of cryptozoology, it’s easy to maintain an open imagination about the types of creatures that could live undiscovered in the ocean. There’s just more potential for imagination when it comes to ocean creatures. They also seem more threatening- since the deep sea remains so unexplored and mysterious, you never know what could emerge and start causing havoc. These kinds of things are fun to imagine. Just look at the types of creatures that inhabit the darkest depths of the ocean. Things like the anglerfish. Very freaky looking. Aphotic Zone Anglerfish by Jake LaGory. You have published a coloring book of cryptids from around the world. How did that concept come about? The idea came to me several years back, when ZaPow hosted a Cryptozoology-themed group show for all its member artists. I thought it would be cool to submit a short coloring book that put a natural spin on some famous cryptids. The project grew from there. I missed the deadline for that show by far, but ended up with book of 22 original illustrations. To talk a bit more about the guiding principle for how I designed each creature, I’ll use the example of mermaids or merfolk. Within cryptozoology, mermaid specimens are often depicted as having human (mammal) and fish parts in one organism. This doesn’t really make sense, as no other animals exist that are a combination of two such vastly different types of organisms. You’re either a mammal or a fish. One creature can’t be both. This kind of creature would need to have a magical explanation, which didn’t fit with the theme or style of my book. Therefore, the “mermaids” in my coloring book are pretty much a primate that has evolved over time to swim in the ocean- basically an ape with a body that resembles a seal. It’s still highly unlikely that such a creature would remain undiscovered in our time, but I had a lot of fun creating a book by putting famous legendary creatures through this thought process. As an outdoorsman have have you ever had any close encounters with any dangerous wild animals? Black Bears are pretty common here in the Blue Ridge Mountains. I’ve had to bang on the windows to scare a bear away from my outdoor garbage can, but that was within the safety of my home. Animals like to keep away from us.The only truly frightening experiences I’ve had out in nature have been weather related. I’ve been camping with tornadoes blowing nearby and canoeing on rivers that flooded overnight. I’m about a third of the way through a series of 9 or so digital paintings that depict imaginary deep sea life, named “The Aphotic Zone” after the portion of ocean that’s always in darkness. The purpose is to explore and accentuate the different ways animals adapt to lightless environments. Each creature is based on an actual ocean animal, but its light tricks are a bit more elaborate and fantastic than what is usually seen in nature. Still, the series is very grounded in science. Sort of a similar design process as I used on my book of cryptids. It’s also fun to create an illustration where the light source is the creature itself- not the usual sun, lamp, or open window. Be sure to follow Jake LaGory’s work by checking out his website (www.jakelagory.com) or blog (jakelagory.tumblr.com). The first three species in The Aphotic Zone series can be viewed there. His Cryptozoology Coloring Book and various prints are available for purchase online and in person at ZaPow. C.E. Allan was born in East London, England. His passion for stories started at the age of three. He was transfixed with books like James and the Giant Peach and The Lion, the Witch, and the Wardrobe. Television programs like Batman with Adam West. And he was completely mesmerized by movies like Clash of the Titans, Jason and the Argonauts, but his all time favorite hands down is Star Wars. That unquenchable passion made him become a writer. His novel incorporates all the elements of the books he read growing up, making it a mix mash of fantasy elements. The book focuses on Sara Fuller. This is something twenty year old Sara Fuller quickly learns after she reunites with Niobe Freeman, after being in hiding for fourteen years. Niobe holds the secrets to a past she cannot remember and offers her the keys to a future where Sara can live the life she wants to live. When Sara inherits everything that is hers and lives the life she had always dreamt of, the unspeakable powers that turned her world upside down discover that she’s still alive. Sara discovers the dreadful truth about her parents deaths and a prophecy that will determine the very fate of the planet. Sara’s only hope of saving our world is to fulfill the inconceivable plan Niobe has set before her. Can Sara overcome her greatest fears to achieve the impossible? Can she accept the truth of her fate? The Ancient Ones: Prophecy of the Ilat tells the story about a girl who has to overcome impossible obstacles to save her life and the future of the planet. The word, ‘ILAT,’ is Sumerian for the supreme one. Is it a series or stand alone? Who are the main characters in your story? Sara Fuller (Real name Tianna Collins), who’s the protagonist. Niobe Freeman, the person who saved Tianna from certain death, and Enki who is the chief god from Sumerian mythology. My writing style is narrative. How I write can be described perfectly from an excerpt from, Finders Keepers,” by Stephen King. A good novelist does not lead his characters, he follows them. A good novelist does not create events, he watches them happen and then writes down what he sees. A good novelist realizes he is a secretary , not god. What would you compare your book to? It’s difficult for me to compare my book to another because I can’t think of a book that it’s similar to. To me it’s like Mission Impossible meets Dragon Ball Z (without the screaming). My kids will say Throne of Glass by Sarah J Maas, because both books have a kickass heroine. Fantasy covers a wide spectrum how does your book fit in this genre? The setting for, “TheAncient Ones,” is based in a world where the earth is made up of three alternate realms that can only be accessed through hidden portals. It is based on Sumerian mythology and Zecharia Sitchins interpretation of the first ever writings, the Sumerian tablets. He believed that the gods of the Sumerian texts came from the planet Nibiru, which was once the tenth planet in our solar system. He believed that Nibiru was destroyed through a cataclysmic war, which also affected Pluto, and the surviving beings known as the Anunnaki or Anuna relocated to Earth. The two main characters of the book are the hybrid offspring of the Anunnaki and they have the ability to manipulate matter and the four universal forces. What is next for you literary wise? I’m writing the second part to the ancient ones. Why should someone read your book? When I completed my book, I gave a copy to my fiancé who is super critical, my sister who is a veracious reader, and my two oldest kids. Their feedback blew me away. They loved it so much, I couldn’t believe their reaction. I sent copies to a few more friends. The feedback was exactly the same. It was for this reason I decided to publish. It is for this reason only I believe people should read my book. Dan Steadman’s Film “Proximity” Hits Wehrenberg Theaters. I’m Sorry Baby. Let’s Dance!